Jon Langham - For Shaw Media Matthew Jazwinski listens as his bandmates rehearse a rough portion of a song. 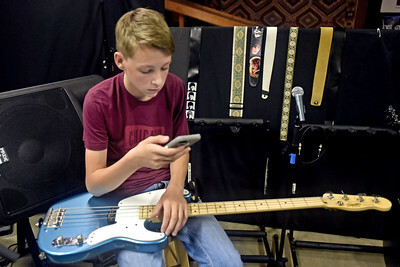 Rock band Pulsebeat, organized by Matthew Jazwinski and some of his friends, rehearses for an upcoming benefit show for a children's hospital Saturday, September 17, 2016 at Consolidated Music in Barrington. Jon Langham - For Shaw Media Members of the band, l to r: Sarah Cullen, Tristan Ribbens, Matthew Jazwinski, Daniel Souvigny, Andrew Stolz. Rock band Pulsebeat, organized by Matthew Jazwinski and some of his friends, rehearses for an upcoming benefit show for a children's hospital Saturday, September 17, 2016 at Consolidated Music in Barrington. 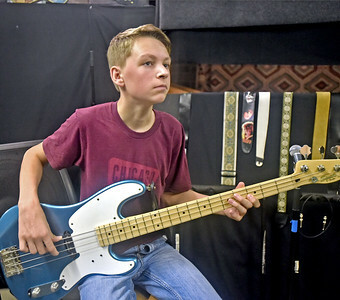 Jon Langham - For Shaw Media Bass player Matthew Jazwinski plays along on a song. 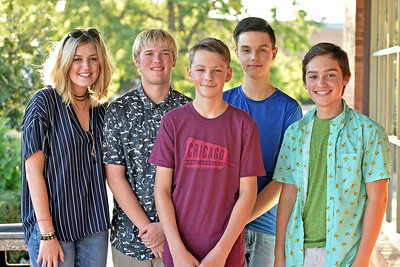 Rock band Pulsebeat, organized by Matthew Jazwinski and some of his friends, rehearses for an upcoming benefit show for a children's hospital Saturday, September 17, 2016 at Consolidated Music in Barrington. Jon Langham - For Shaw Media Bandmates Tristan Ribbens and David Souvigny listen as Matthew Jazwinski plays the bass portion of a song in rehearsal. 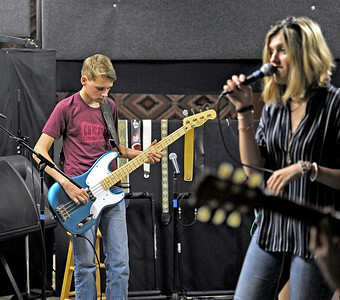 Rock band Pulsebeat, organized by Matthew Jazwinski and some of his friends, rehearses for an upcoming benefit show for a children's hospital Saturday, September 17, 2016 at Consolidated Music in Barrington. Jon Langham - For Shaw Media Bass player Matthew Jazwinski plays along on a song as vocalist Sarah Cullen sings. Rock band Pulsebeat, organized by Matthew Jazwinski and some of his friends, rehearses for an upcoming benefit show for a children's hospital Saturday, September 17, 2016 at Consolidated Music in Barrington. Jon Langham - For Shaw Media Matthew Jazwinski checks messages on his phone during a break in rehearsal. Rock band Pulsebeat, organized by Matthew Jazwinski and some of his friends, rehearses for an upcoming benefit show for a children's hospital Saturday, September 17, 2016 at Consolidated Music in Barrington. Bass player Matthew Jazwinski plays along on a song. 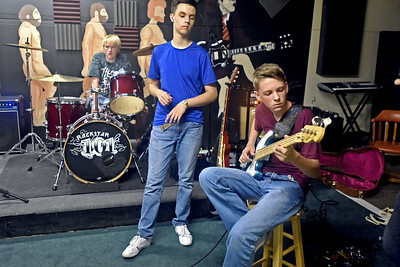 Rock band Pulsebeat, organized by Matthew Jazwinski and some of his friends, rehearses for an upcoming benefit show for a children's hospital Saturday, September 17, 2016 at Consolidated Music in Barrington.